Another reason why CNN lacks credibility as a legitimate news channel. The Baghdad Bob media still can't come to grips on why the American people are continuing to tune them out. People are sick and tired of the elitist liberal manipulators in the media continuing to push their "activist journalism" agenda. In the latest cable ratings that came out a few weeks ago, it showed that the Cartoon Network was more watched then MSNBC and CNN combined. There is a reason for that. Most people do not trust the content that comes from those two channels anymore. To call them news channels would be a slap in the face of true media outlets that practices journalistic integrity however few there remain. Yesterday, Sarah Palin hooked up with the Tea Party Express in Searchlight Nevada. In this clip, CNN reported the crowd at a few hundred, maybe a "few dozen"
From watching this video, you will notice something that CNN didn't do. They showed an extreme close up of Sarah Palin, but the cameramen didn't pan out to show the entire crowd. 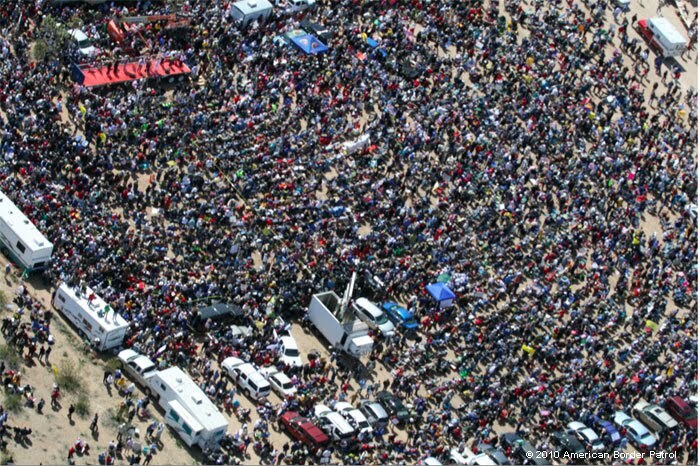 With Harry Reid's poll numbers in the 30's and Sarah Palin given a speech on his home turf, nobody would believe for a moment that only a few dozens to several hundred showed up to hear her speak. I'm going to have to give credit to the Politico for once actually doing their job. The Politico reported the crowd at about twenty thousand. 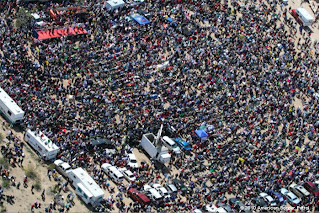 These are the areal photos from the American Boarder Patrol of that event. Here are some more photos of the "few dozen" that attended. Since CNN can't be honest enough to report the truth about the amount of people who showed up to hear Palin in Searchlight, why would they believe CNN when they "claim" that Palin is "inciting violence" among Tea Party activists aimed at Democratic members of congress? Of course, CNN and the rest of the media has yet to back up their reporting of this, what else is new? Liberal David Shuster of MSNBC couldn't take being educated on the Tea Party and the Democratic Party by a black conservative. When I saw the interview with David Shuster trying to run rough shot on author and conservative blogger Kevin Jackson, I bet David was asking himself, who is this guy. Kevin Jackson was invited on David's show to discuss the supposed violence by the vast right wing conspiracy against Democrats who voted for Obamacare. 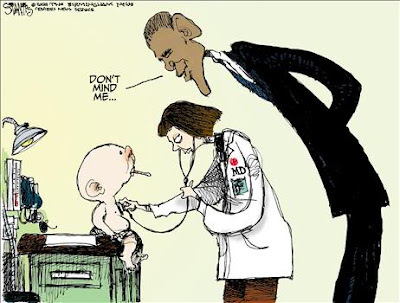 The media has been reporting that the people who have vandalized the headquarters of Democrat Congressmen are people who are opposed to Obamacare. They have yet to prove any evidence to validate their claims, surprise surprise. Of course this so called outrage is merely an attempt to deflect the attention away from the Democrats being the traitors that they are, by trying to present themselves in the light of being victims of the right wing hate machine. I absolutely love the way Kevin handled David in this interrogation slash interview. Uploaded by burghnews. - News videos from around the world. David didn't know how to handle Kevin, when Kevin brought up fact after fact after fact about how Democrats create false scenarios so they can advance a bogus template about right wing aggression aimed towards them. Liberal hosts do not like to interview guests who are conservative and can put them on the defensive. If I was Kevin, I wouldn't be looking for another invite from David anytime soon. Since we are on the top of supposed right wing rage, let's take a stroll down memory lane. Democrats have always called Republicans Nazis right? Back in 2004, the campaign offices of Bush- Cheney were vandalized. Swastikas were burned into the lawns of Bush supporters. Oh, I can't forgot the ugly incidents of Bush supporters having their cars keyed, because they merely displayed Bush-Cheney bumper stickers on their cars.Even some Bush supporters were stalked in cases of road rage due to their display of Bush-Cheney bumper stickers. So much for liberalism and tolerance. My how Democrats and the media so easily forget those good ol days. Here's the difference on how people on the right and in the middle protest and how people on the left protest. Fear those conservative elderly people and those stay at home moms. We all know they are the true hate mongers in our society right? ;-) Just last year, a conservative was beaten up by Democrat union goons. This story wasn't even touched by the national media, go figure why. So Democrats want to say that Republicans are fanning the flames of hatred, due to the passing of Obama right? Sounds to me like the Democrats like always are just trying to cry wolf in order to try and take the nation's attention away from them for the treasonous act they committed against this country with their votes on Obamacare. Rep. John Dingell let the cat out of the bag about the true motive behind Obamacare. When liberals are among themselves, they tend to be themselves and speak openly and freely. In others words, they can let go of their act of pretending to care about the American people. That is usually when they tend to let their true motivates come to the surface. Nobody with an ounce of brain matter thinks for a moment that the motivate behind Obamacare is to provide health coverage to those who do not have it. I can say the reason until I am blue in the face, so I will let Democrat John Dingell spell it out for the Obama true believers to the trojan horse agenda behind Obamacare. The 0:48 second mark is all you need to know. Here's a blast from the not so distant past. This is Congresswoman Maxine Waters back in 2008 "accidentally" letting her guard down and exposing to the oil executives what she would do to them. Notice how she caught herself at the 1:16 mark when she halfway let out the word "socialize"
Even CNN can't spin how Americans do not want Obamacare to become law. I've said it before that every poll is showing that Americans are as mad as hell at the thought of Obamacare becoming law. CNN is normally the mouth piece for Obama and his fellow liberal hordes. The Baghdad Bob media now has a problem. They can't spin the American people's disgust over this bill. In the latest CNN poll, 59% hold an unfavorable opinion of this bill that will become law tomorrow. CNN " A majority of Americans have a dim view of the sweeping health care bill passed by the House, saying it gives Washington too much clout and won't do much to reduce their own health care costs or federal deficit". It is safe to say that if Obama campaigns for any candidate facing re election this year, it might as well be considered the kiss of death for that Democrat candidate. When Obama's allies in the media can't smooth over the waters for their messiah, Obama and Democrats have a huge problem on their hands. Most of the people who are opposed to Obamacare know what is in the bill. The people who oppose Obamacare know more about this piece of legislation and what it will do then the traitorous sellouts who voted for it and didn't even read it. This poll by of all places CNN shows that the Americans people by a near 60% majority aren't stupid and won't be played for stupid by Obama, Pelosi and Reid. For those who believe that Barack Obama isn't a socialist listen up. Barack Obama is a socialist and tomorrow will prove that without one remaining shadow of doubt. The left has been trying to deflect the word socialist from sticking to Obama ever since he arrived on the national scene six years ago. The left could never prove Obama wasn't a socialist. All they could do was deflect and smear those who called him one. If anyone did the research into Obama's past, they would easily realize that Obama was indoctrinated into socialist ideology from a very young age. What other word describes "re distributive change" and "economic justice"? I support everybody in our country having the "opportunity" at success. Redistribution has never elevated the recipients of other people's wealth out of poverty, and it never will. The left tried to smear the right as being racist for calling Obama a socialist, basically claiming that the use of the word socialist is the new "N" word. Of course their weak attempt at deflection didn't work, because there are far more white socialists in the world then there are black ones. Well now I guess Al Sharpton is calling Barack the "N" word. Of course Al is lying through his teach or is just flat out confused. Barack's main platform was to fix the economy. It wasn't until the stock market started it's deep decline that Barack pulled ahead of McCain in the polls. Also, the number one issue that came out of the exit polls was the economy. I've said it for the longest time that liberals only know how to lie, lie and lie. The truth is so foreign to these people, it's pathetic. If the American people wanted this legislation so much according to Al, why did all the polls so otherwise? If Al was presented with that very simplistic question, he wouldn't answer it directly, because he wouldn't be able to. When Republicans take control of congress running on the platform of repealing this bill, then I wonder what will be Al's excuse then? Even though Fox News is number one, I have to question are they suffering from a guest talent shortage? Al Sharpton should be doing twenty to life in prison and not being taken seriously on a cable news channel. Obamacare to become the law of the land. The people had eyes, yet they refused to see. Barack Obama claimed to love America in one breath, yet said he was going to fundamentally transform the United States of America in the next breath. It looks like he is going to do just that. The Senate health care bill passed in the House of Representatives by seven votes and is now on it's way to Obama's desk to be signed. The socialists have won a major victory tonight and our country has suffered a huge setback. There is an old saying that goes "The biggest lie deception the devil ever committed was convincing people he didn't exist". As much as I would like to blame Obama and his band of liberals in congress for the passing of Obamacare, I have to blame some people that most people wouldn't think of. I don't blame the ignorance of gullible, naive voters who voted for Barack Obama. That would be way too easy. I blame George Bush, John McCain and the 2005 Republican congress. Five years ago, most Americans were outraged over what congress was trying to do with attempting to ram an illegal amnesty bill down the throats of the American people. George Bush, John McCain and Republicans in congress back in 2005 were the same as Democrats and Barack Obama are today in 2010. The only difference is that Democrats have succeeded in passing a bill that the majority of Americans do not want. George Bush helped to start the gears in motion of an American backlash that helped usher in Pelosi and Reid into power in 2006. The selection of John McCain who was the main spear head of Bush's amnesty bill was like icing on the cake for the Democrats. This allowed for Barack Obama to be elected and thus created the environment for which this sad chapter in American history has now unfolded. With all of that being said, the fight isn't over yet by a long shot. The two prong battle plan is as clear as day going forward. Conservative Republicans must take over control of congress in less then seven months, and a conservative must run in 2012 on the platform of repealing Obamacare as his or her first official act after being sworn in. There are going to be many lawsuits filed over this "law" by citizens, constitutional groups and even by states as well as states passing their own laws to block the federal government from infringing on their rights. As I said, this isn't over by a long shot. Once people start to see how this new law is going to adversely screw them over, they will be very upset to the point of revolt. Flying the American flag upside down is a symbol of distress. If this isn't a time of distress, then I don't know what is. Michael Savage said it best. Beware of the enemy within. That enemy has just voted to give this country poison while smiling in our faces and saying they are doing it for our own good. On a seperate note, I have to give credit and thanks to Minority Leader John Boehner. He stood on the floor of the house and told it like it is. This is how color blind some liberals are when it comes to interracial adoptions. Vanessa Williams ""It brings up a theme for black folks that, okay, here's another white family that has saved the day in terms of another black story that has to have a white person come in and lift them up. And I'm not saying that it's not true and it didn't happen, but it's one of those, do I really want to see the same theme again?" Joy Behar "But the issue with [The Blind Side] is that it gives the false impression that the problem of poverty and homelessness can be solved by the largesse of some liberal good family ... Liberal meaning, I wasn't referring to liberal as the party. I was referring to liberal as an open-minded and loving gesture. ... But I believe that that does not address the systemic differences in the races, in homelessness, in poverty in the country. And it puts a band-aid on the situation, and it's lauded as a solution to the issue, and it's not. I doubt liberals existed in both political parties in this country. Now I know why Joy is so smart, NOT! I don't believe liberals know what they want when it comes to race in America. They claimed they wanted a color blind society, yet they can't come to grips half the time that Barack Obama is president. To them, we might as well still be living 1964 rather then 2010. If white families are adopting children of different races and providing them with a loving home, isn't that the success of a "COLOR BLIND SOCIETY" which is what liberals claim they wanted?! !The National Association of Black Social Workers might as well be the black equivalent to the Klu Klux Klan. I can only imagine what the social response would be if there was a National Association of White Social Workers who's mission is to place white children in only white families. Well, that the mission of the NABSW is to do just that for black children with black families. As with left wing ideology, there is usually a piece of the puzzle missing in it's rationality. I'm sure it never occurred to the NABSW that there simple is nowhere near enough black families to adopt every black children needing adopting. So really the NABSW doesn't really care about whether that child is loved in a family regardless of the race of the family. As with liberalism, it's "all about the collective and not about the individual". Where's the love in that? The liberal's messiah bowed down and kissed the ring of Rupert Murdock and Fox News. Talk about a humiliating moment for Barack Obama and his loyal flock. For several months, Barack Obama and his cult have been talking smack about Fox News almost non stop. Liberals have been trying to convince themselves that Fox News is some pure right wing propaganda channel even though Fox News has more liberal commentators then MSNBC & CNN have conservatives combined. Well it must have been a demoralizing sight for them to have watched their beloved cult leader Barack Obama sitting down to do an interview on Fox News with Breit Bair yesterday. I wonder how the loyal Obama cheerleaders over at MSNBC and CNN felt about what Obama did? By Obama doing an interview on Fox News and not MSNBC or CNN, Barack in essence showed the nation that MSNBC & CNN are irrelevant when it comes to being influential in the media. I know Dr. Tingles Chris Matthews couldn't have been happy about what his sweetheart did. I know for sure that if Obama would have agreed to have been interviewed by Matthews, Matthews would have wet himself due to being overwhelmed with joy. The media winds have changed and are blowing in a different direction. The alphabet networks along with CNN and MSNBC no longer control the content and the deliverer of the content in the media. I do wonder how Obama is going to explain to his kook base that he had to humble himself and ask Fox News for help in order to promote his health care bill? Since liberals consider Fox News to be nothing more then right wing propaganda, then here is my very simple question. Why did Barack Obama agree to be interviewed on a channel he considers hostile towards him? If Fox is "faux" news as the left puts it, I would love for them to explain why their hero Obama did an interview for "faux" news then? The only thing that is faux is the liberal's perception of Fox News and it's dominance as the most trusted name in news. Freedom has definitely taken root in the Middle East when it comes to Islamic women being able to show their stuff. Quick Recap:Senator Jim Bunning tarred and feathered, because he dared to hold Obama at his word. The motto for Obama and Democrats should be "don't take us at our word or hold us to it". This whole Senator Jim Bunning "controversy" is such a freaking joke. The media barely covered the legitimate problems facing Charlie Rangel because of him violating House ethics rules. The media had no problem using Alinsky Jijutsu on Senator Bunning. Bunning's words didn't matter to the media in how they reported on him. All they cared about was that he was the obstacle holding up unemployment benefits. Democrats and the media went as far as to say that Seantor Bunning was "filibustering" the transportation bill. Our nation is in deep trouble when morons in the media and congress don't even know what a filibuster procedure is and what isn't. Then again, maybe they did know. They just thought they could smear Senator Bunning with the "seriousness of charge" and that would be enough. It was Barack Obama who said of Feb 13th that he wanted to see Pay GO rules implemented going forward. The only thing Senator Bunning did was "hold Obama to his word". For him believing Obama, Bunning was tarred and feathered as being the grinch who was trying to deny people unemployment benefits. The Republican leadership was pathetic in not standing behind and supporting Seanator Bunning. How can these jokers talk about fiscal restraint when the cameras are on them, yet they run for the hills when they have to back up those words in a real life situation? The simple fact is that there was no funding source to pay for the transportation bill and the unemployment benefits. I've noticed that Obama also stayed clear in not saying anything on the matter. Lie, distort and smear has become the liberal's three prong attack stratetgy in congress and outside of Washington. I truly believe their attacks on Senator Bunning will not help them come November. In a congress that is seen as being way out of control and out of touch with the American mainstream, Senator Jim Bunning was seen by many as a person who stood up on the principal of fiscal responsibility, and his actions showed that Obama, Pelosi, Reid and their media allies could care less about integrity. Watermelons and State Troopers and Obama oh my! My question is why would Dan Rather think Republicans would say such a thing and independents would buy into it? To me it just shows how racially obsessed yet again liberal Democrats are. Dan was sitting next Chris Matthews who himself said that during Obama's SOTU address "he forgot he was looking at a black guy for an hour". Liberals again seem to have a problem accepting the fact that Obama is the president and is black. I don't pay much attention to Dan Rather any ways. He's just a dinosaur in the news business who can't come to grips that the liberals no longer control the content and distribution of the news. It was funny watching Chris Matthews quickly trying to drone out Dan Blather as soon as the word watermelon rolled off Dan's tongue. Since Dan isn't a Republican or an independent, how does he know how they think or what they would say in reference to Obama, watermelons, and state troopers? Has Dan become a psychic or is he just showing others how mentally frail his mind is as with most liberals? Jon Stewart gives props to Sarah Palin on her appearance on The Tonight Show..
Just when I think I have Jon Stewart finally figured out, he manages to throw a change up and I'm right back to square one. When I saw the segment he did about Sarah Palin on the Tonight Show, I couldn't believe that Jon said some nice things about Sarah and then joked on of all people "Mitt Romney" when he appeared on Letterman. One would think that Sarah's comedy debut would have been red meat for the Palin hating left, but they couldn't find anything. She was so good that the kooks over at the Daily Kos are now trying to float a conspiracy that a "laugh track" was placed in the audience when she appeared. The thought that people in the audience actually liked Sarah is beyond belief to the tin foil hat brigade. In a funny way, Jon brought up something interesting. People in the political chattering class have been saying that if Sarah Palin runs, her toughest competition will be from Mitt Romney. They have been saying this, because Mitt is very charming and has a lot of charisma. Jon noted Romney was "boring" while Palin was energetic and more personable. In other words, she wasn't a dead fish like Romney was on Letterman. I can't say that this was Romney's fault. It is usually the responsibility of the host to bring out the best in their guests. So really I don't fault Romney, because I've seen Romney in charm mode before, and he can work a crowd and camera when he wants to. The blame for how Romney came off rests with David Letterman. This is a reason why Leno has been the king of late night comedy for 17 years and counting. Maybe Juan is still hurting from the exchange he had with Warren Ballentine a few months ago. I defended Juan when Warren made a racial statement towards him at the end of the interview on Bill O'Reily's show. Juan responded to Warren's racial statement later when he was guest hosting Bill's show. In his commentary to the statement Warren made, it was clear that Juan was very ticked off about what Warren called him. It would seem that Juan is good at dishing out certain comments about others, but he can't take it when it is thrown at him. What Warren Ballentine said about Juan was racial in nature, and what Juan said about Sarah was sexist in nature. I really would like to ask Juan the following questions about Sarah Palin if I ever had the chance to. 1. Would a President Sarah Palin ever bow to world leaders and the Mayor of Tampa Florida like Obama did? 2. Would a President Palin ever refer to the Navy Corpemen as "CORPSEmen" three times as Commander in Chief? 3. Would a President Sarah Palin lie uncontrollably to the American people on every issue? 4. Would a President Sarah Palin think so little of the American people and try and ram through a bill that Americans overwhelmingly don't want? 5. Would a President Sarah Palin subscribe to Keynesian economics and spend our country trillions of dollars into the hole to create imaginary shovel ready and green jobs? 6. Would a President Palin know what it takes over Obama in knowing how to jump start the private sector into hiring and getting the economy moving? We've seen the damage Barack Obama has caused in little over a year and counting as president. If these are the actions of the "smartest person to ever become president", then I would rather have a person as president who is the opposite. The prerequisite to be president shouldn't be about who is the most "book smart" person. It should come down to who has a better grasp on "common sense solutions". I know for a fact that a President Sarah Palin wouldn't dare be a big government spender like Obama is for a simple reason. I believe Sarah knows through "common sense" that by the government continuously spending, more and more money, that money is going to have to be paid back at some point. She knows that raising taxes to pay down a massive government debt will mean more money will be taken out of people's pockets to pay down the debt thus leaving less money to spend in the economy in order to contribute to it's growth. It doesn't take a college professor to figure this out. This is what Juan left out in his sarcastic dissing of Sarah Palin. Sarah knows all about how to run government, she has the experience doing it. She knows who are the job creators and that government is no substitution for the private sector. Once again, it doesn't take a college professor to figure this out. I'm not a Harvard Law School graduate like Obama, yet I understand how the economy works, go figure! Liberals really don't know how two faced and bigoted they truly are. It frankly amazes me to the level of how clueless and naive these people truly are. These are the self righteous loud mouths that say that conservative men like their women "barefoot and pregnant" while slaving over a kitchen stove. I'm sure liberals like Juan William believe that. I came to a conclusion a long time ago that liberals project their own intolerance and closed minded traits onto conservatives. Here is an example of what I mean. Lets say for example that a liberal female was born and raised in New York City. This liberal female became a council woman from the Bronx and eventually became Mayor of New York City. This liberal female later ran for Governor and won. Lets then say that this liberal female was picked by the Democrat nominee for president to be his Vice Presidential running mate. What would happen if a high profile conservative male republican would have said that "the only reason why this female is successful is because she is attractive", what would have been the response to such a statement? That conservative would have been destroyed times ten over not only by the media but by every feminist group in this country along with liberals in general. I know how the game is played, so there really isn't no denying or disputing this fact. I know Juan Williams is an arrogant elitist prick. He has proven it over the years with great consistency. I know liberals like Juan can't stand the thought of Sarah Palin for some unknown reason, but the approach taken by Juan really was an attack against all self made women. When did it become a sin for a woman in politics to be attractive? I would love to ask Juan does a woman has to unattractive in order to be acknowledged for her accomplshments or as long as she is liberal then she's exempt? Juan Williams has his head so far up his rear end, he can't really smell the roses so to speak. I doubt completely that Juan would have ever said that the only reason Geraldine Ferraro was successful was because she was attractive. He couldn't' really have said that, because she really wasn't attractive. Beauty is in the eye of the beholder I know. Sarah Palin is a self made conservative woman, and that is something that Juan can't wrap his elitist mind around. The candidacy of Hillary Clinton for the U,S Senate and the Presidency was based entirely on her last name of Clinton. In many ways it can be said that George Bush benefited from his father Herbert Walker Bush being president and his last name. Here's the thing to note, the Palin name was made famous not by Todd Palin but by "his wife". What pricks like William can't stand to admit is that it was Sarah who became a city councilwoman and then mayor of Wasila. It was Sarah who ran and become governor of Alaska. These were all her accomplishments and hers alone. I found it fascinating that Juan thought that Sarah couldn't match up against Barack. The reality is that Barack Obama has never faced any true competition. This is the fact that can't be disputed. Nobody in their right mind would say that John McCain and Allen Keyes was legitimate competition for Obama. I hate to burst the fantasy bubble for which Juan lives in, but Barack Obama isn't as smart as he is fooling himself into believing he is. What the nation if figuring out is that "professors don't make for good leaders". Dylan Ratigan and Journalistic Integrity 101 or lack there of. Mark Williams is the founder of the Tea Party Express and a radio talk show host. I don't know what the hell Mark was thinking by accepting to be guest on Dylan Ratigan's MSNBC show. MSNBC has lost any credibility a long time ago as a valid news organziation. This video is going to be shocking for people to watch and just a refresher for others. The term "activist journalism" does have meaning. Tell me if you think that Dylan Ratigan showed any grain of journalist integrity in his "interview" with Mark Williams. To me, the premise for which Dylan had Mark on his show was bogus in the first place. With MSNBC, everything as always revolves around race and conservatism. Dylan invited Mark on his show for the sole purpose of trying to stain the image of the Tea Party movement as being a breeding ground and a magnet for racists. Dylan wasn't a fan of the Tea Party movement before Mark came on his show, and his bias and hatred for the tea party movement came boiling to top and running over for everyone to see in a big way. Dylan's little outburst and hissy fit didn't help in giving people a reason to trust MSNBC as a legitimate news channel. If anything, it just validated the reason why so many people stopped watching it in the first place a long time ago. I guess Dylan thought that if he just kept talking over Mark that would somehow make Mark look guilty or something. This tactic of talking over guests in order to make the host seem like he or she is right isn't new to MSNBC. Mr. Tingles aka Chris Matthews pulled the same stunt a few years ago with Michelle Malkin. Bullying and activist journalism doesn't pass for credibility.